I'm extremely excited to write this final part of the series. The song "An Unexpected Me" is finally done and released under the band name Flip That Switch. The song took a new direction (compared to the song described in parts 1 - 4) and I'm extremely happy with how it turned out! For this series I wrote the introduction post on October 1st, 2015. Part 4 came July 18, 2016 and now part 5 on March 3rd, 2018. Why the heck did it take so long to finish the song?! When I wrote part 4 I had all the guitar parts recorded and lyrics written. I started looking for a drummer to collaborate with but couldn't garner enough interest in that version of the song. Then life got busy, I lost motivation, and shelved the song for another day. And somehow an entire year flew by. Then in Fall 2017 a few things happened. A new band called Cyhra released their debut album "Letters To Myself". I was blown away by it! In particular how catchy and memorable the songs were. For example check out the chorus in their song "Heartrage". Listening to this album started to rekindle my interest in writing and recording music again. Around that time I also attended a few incredible live shows (including Rammstein and Iron Maiden). I noticed how certain songs would draw a particular energetic reaction from the audience. The audience would get engaged with the song and want to move and dance to the groove. Capturing this groove, something you can bob your head up and down to, was what these artists excelled at. Getting a person moving and excited is what made the live experience of rock music so much fun. So I began to imagine how fun it would be to write a song like that. A song that rocked, grooved, and would be fun to play live. A song that captured that vibe. I listened to what I had recorded in part 4 and found that my song had none of those characteristics. It wasn't a rock a song, it didn't groove, and I wouldn't be excited to play it live. And yet it had potential. The riffs and chord progressions could be repurposed. The song needed some electric guitar distortion and a new arrangement. I also realized that my intentions when starting this series of blog posts were not focused on writing a song. Instead I put more focus on this series of posts, the song became an afterthought. That's why I lost interest in the music after writing part 4. And so I shifted my mindset. I put all my focus into writing the song. Specifically a rock song that I would be excited to play live. A song that could garner that same audience reaction I saw when attending the aforementioned live shows. And yet I had apprehension. Here I was about 2 years after I wrote the first post in the series thinking of redoing the song. What was going to prevent me from putting the song on an indefinite hold again? Was it going to take me another year just to re-write the new version? As a solo song writer I often struggle with "writers block". I come up with a section (say a verse) but then not know where to go next. My internal dialogue fields questions like was this new section interesting enough technically and musically? Was it good enough for the song? This perpetuated into self-doubt, indecision, and ultimately blocked me from continuing to write music. This question became my mental approach and panacea. I set the intention that if I hit a roadblock during the re-writing process I would ask myself, what if this were easy, what would I do? This approach empowered me to make decisions during the re-writing process. So when I did hit a roadblock I would ask myself, what if it were easy, what would I play in this section? It wasn't literally playing the "easiest" thing, but playing something, anything. Then making various tweaks and moving forward. The mindset was to keep moving forward. Make decisions. This helped me unlock my creativity and allowed me to re-write the song in a reasonable amount of time. So instead of trying to write the perfect song, I just wrote what sounded good to me with the intention of moving forward and getting it finished. This version has some cool riffs and chord progressions, but the arrangement isn't very exciting. So I set an intention: re-write the song so that it grooves and rocks. So that it would get a listener to bob there head up and down and want to move with it. I came up with a Def Leppard inspired riff that became the intro of the song (first 30 seconds). Through jamming I came up with the chords for the pre-chorus which connected nicely into the chorus chord progression I repurposed from the first version of the song. Like Lego blocks I began to piece together individual sections. I had an intro/outro, verses, pre-choruses, choruses, and a solo section. I focused on the connections between each section to ensure they were seamless and tight. I didn't overthink them, asking myself constantly: what if it were easy? For the final version of the song I re-recorded all of the guitars to tighten and clean them up. For my recording process read part 4 in this series. Next up was writing the vocal melody and lyrics. Writing a vocal melody was a bit foreign to me. To get started I utilized an approach taught to me by my music teacher. The approach is to essentially analyze the music of a composer you admire to break down the relationship between the harmony, melody, and rhythm. I really like the chorus in the song "Holding Your Breath" by Cyhra so this is where I applied that approach. I figured out the chord progression by ear and then learned the vocal melody on the guitar. This gave me insight as to how the vocal melody sounded and played on the guitar. Thus I was now thinking like a vocalist, but instead of singing I was playing the melody on the guitar. I then used this mindset to write the vocal melodies on the guitar for An Unexpected Me. Now I needed to write lyrics for these melodies. This was a major challenge. As I sketched out several ideas nothing felt right. So I started Googling "how to write lyrics" and I came across a site whose first point of advice was to not write clichés such as "I walk this road". I looked at my notebook of ideas and one of the first lines I wrote was: "I walk this road". So yes, my lyrics needed some work. I took an approach by starting with a theme. In this case it was "expectations". Thinking about where they come from and how much they define us and our experiences. Going on this theme I started to match up phrases to the vocal melody. I now had the guitar parts recorded and lyrics written. It was time to find other musicians to join me on this song! This song would still be in demo form had it not been for the incredible musicians I was fortunate enough to collaborate with. I give these guys my biggest thanks for bringing this song to life and making it sound so much better than I imagined! I started my search by looking for a drummer. I wanted someone who was technically proficient, had a great recording sound, and had a groovy feel to his playing. My strategy was to search on YouTube for drummers covering songs that influenced me. I felt that if the drummer had a solid performance, they would have the right mindset and feel that I was looking for in my song. I found Tony Parsons through his insanely good cover of the Genesis song "Dance on a Volcano". I then saw his cover of "Fallen" by Symphony X. I was sold, this was the guy I needed! I sent Tony the song demo and he agreed to add drums to the track. The only direction I gave him was make it groove. I fully trusted his instincts and was blown away by what he came up with. He captured the exact feel I was going for by making the drums groove and propel the track forward. Even though Tony is physically in a different state from me, the recording process was straightforward. He sent me his first version by adding drums to the guitar backing track I had sent him. I sent him some feedback for a few tweaks, and we then had a final version of the drums. The power of the internet! Next I started to look for a vocalist using the same YouTube "cover a song I like" strategy. I found Valentino Francavilla covering the song "I Don't Believe In Love" by Queensrÿche. I was blown away by his performance. He not only technically nailed the song, but brought his own unique voice to the song. I was determined to get this guy to join the song! While I was pitching Valentino I started to look into the guitar and bass player who covered the song with him. Enter Rocco Pezzin. Rocco turned out to have a swiss army knife skillset of music production. Not only is he a monster guitar player, but he also specializes in bass and music production. I contacted him and he agreed to collaborate by adding the bass guitar and mixing and mastering the song. Sharing my 80s metal influences I only needed to give him limited direction as to how I wanted the song to sound. When he sent me his first version of the mix (including bass guitar) I was truly impressed. The song was starting to come together! During this time Valentino recorded the vocals. He sent his recorded files to Rocco to be added to the mix, and Rocco then sent me a mixed version that included all the parts. I had a sense of what to expect from the vocals given that Valentino utilized the guitar melodies I had sent him, but I was still really amazed by his performance. He added various tweaks, intonations, and harmonies that I didn't have in the guitar melodies. He knew the style and vibe I was going for in the track and he absolutely nailed it. The song had come alive and was ready for release! By the way, Valentino and Rocco are based in Italy - the power of the internet! While writing "An Unexpected Me" I started to write another song. This new song currently has the guitars and drums done, and I'm now working on the vocal melodies and lyrics. Not sure yet when this second song will be released, but it is in progress! The current vision for Flip That Switch is to release two songs, and then it's a big TBD. As inspiration strikes I may compose additional music and continue to release as singles. But for now the plan is to just release two songs. As far as "An Unexpected Me", it was a tremendous pleasure to collaborate with Tony, Valentino, and Rocco on this song. The beauty of finding the right people to collaborate with is that with limited direction they will contribute in ways you couldn't have anticipated. Because of shared musical influences these guys knew exactly what the track needed! I can now bring closure to this 5 part series. This is my blueprint for recording a song. If you got here first, check out the introduction, part 1, part 2, and part 3 of this series. I ended part 3 expressing my dread for recording the final guitar takes. Hard to believe I wrote that part 5 months ago. Life got in the way and I indulged every excuse to procrastinate recording. But I'm happy to report that guitar recordings have wrapped! Part of the reason for the delay was prioritizing a block of time to setup my recording environment, get my guitar and playing chops in shape, and then do the actual recording. The time to set and warm up would not warrant the 20-30 minutes I would then have available to record. So I finally set aside time during two weekends and was able to finish recording. I took a different approach recording this song compared to the recording process on Legacy. With that project I recorded by section, until I had takes I was happy with. For this song, I played the full song multiple times and recorded each time as a separate take. I then edited together the best sounding sections from each take to make the final track. In other words I may have used Verse 1 from take 2, Chorus 1 from take 1, etc. This approach allowed me to spend more time focusing on playing, and less time on trying to get a perfect take on a certain section. One of my biggest challenges while recording is playing the role of engineer. The simple task of starting and stopping the recording on the computer can throw off my momentum. Plus when I hear the same section over and over, it becomes difficult to discern the good takes from the bad. Playing the dual role of musician and engineer is also part of the reason it took me a while to get these recordings done. The next step in this project is to find other musicians to collaborate with on this song. At a minimum the song needs drums, bass, and vocals. I may add some additional instruments later, but that is still to be determined. Once the missing parts are recorded, the song will need to get mixed, mastered, and then it will be ready for release! If you got here first, check out the introduction, part 1, and part 2 of this series. In part 2 I recorded a guitar only scratch track of the full song. Since that time I've written the lyrics, played around with a few alternative versions of the chorus, and also added a guitar solo section to the song. My problem was I was trying to write epic lyrics with symbolism and deeper meaning. Therefore I ended up writing about things I had no idea about. So ever since I heard that quote from Corey, I've tried to write about what I know. Whenever things get really hard, I just tell myself, at the end today I'll be home in my bed. I loved the I'll be home part. And that became my theme. But I felt I didn't have enough. So I decided to bring in another source for inspiration. One of my favorite books that I read last year was Radical Acceptance by Tara Brach. I re-read all of my Kindle highlights (all 186 of them) and decided to use the theme of "inviting Mara to tea". Essentially whenever you experience frustration/anger/solitude/etc., think of those feelings as Mara. And instead of trying to block those feelings, welcome them to tea. Accept them. So I decided to combine that theme with I'll be home. The vocal melody you'll have to wait for until the final recording is done. Need to keep some element of surprise. Originally I was going to keep this song basic and not include a guitar solo (or distortion). But as I was jamming on a chord progression a few weeks ago I noted it would be a great fit for this song. So I decided to add it in. I now had the task of figuring out my solo. Unfortunately I don't play as much guitar as I used to, so I wasn't comfortable with improvising a solo. I also wanted to spend a little time playing around with a few different ideas until I got something I was happy with. So after many trials and tribulations this is what I came up with. During the writing process there was a section early in the solo where I struggled figuring out what to play. I had a cool moment where inspiration struck just as I was leaving for work. I didn't know if the idea would fit, so using Apple's Music Memosapp, I recorded this idea. That idea turned into what you hear between 00:15 and 00:20 in the guitar solo demo. Sometimes inspiration does strike randomly. It took a few evenings to piece together the solo, but I'm excited with what I came up with. I think it will be a fun section in the song. So what's next? The part I dread most in this process. Recording. All the recordings you've heard so far have been raw/demo takes. I paid 0 attention to the quality of the recording because I was in song-writing mode. But now in recording mode I'll be very conscious of the quality of the recording. For the final version I'll need to finalize my guitar tones, put on some new strings, allocate 6-8 hours, and just record. It's a dreadful process, but it's part of the job. And there's nothing quite like the feeling you get when all your parts have been recorded and sound awesome. If you got here first, check out the introduction and part 1 of this series. My goal in this part was to take the chord progressions I had come up with in part 1, and put them together to make a complete song . In music production this is referred to as a scratch track. It's a rough draft/prototype of the song. Scratch tracks will vary in production levels. Some may feature the entire band but have limited post-production. Other tracks may have some instruments recorded by musicians, while others (e.g. drums, bass guitar) will be played by the computer. I didn't have time to get into programming the other instruments, so my scratch track is just guitar. Before I hit the record button I needed to figure a few things out. First was the BPM (beats per minute) of the song. Every song you hear has a BPM (aka tempo). It's how musicians are able to stay in time with each other. The majority of music is in 4, 4 time (written 4/4). Turn on any pop song and start counting: 1, 2, 3, 4. You'll have to adjust the speed of your count to fit with the music. The speed at which you count is the songs BPM. For example if the song is 100 BPM, that means you'll count 1, 2, 3, 4...all the way to 100 in one minute. I rely on a metronome (which allows me to set any BPM) to figure out the tempo of my music. I need to know this before I can record my scratch track. Side note: this is especially important when collaborating with other musicians over the web. By telling them what the BPM is of the song, they can program a metronome on their computer to play at that BPM, and this allows them to record in sync with my guitar. How do I know when I find the right tempo? It's very subjective. In the video I start at 76 BPM and then go down to 72. 76 felt a bit rushed, while 72 felt a bit slow. I settled at 74 which is the tempo you'll hear in the scratch track recording below. I also could have done 73 or 75 BPM, but I prefer keeping an even number for the tempo. The counts at the end of each section is how many times I go through the chord progression in the respective section. I now have the bare-bones of a full song! My next step is to figure out the lyrics and vocal melodies. I'll then start looking for a vocalist to collaborate with. I also need to start thinking about if I want to collaborate with a drummer and bass player to record those parts. Or I can take the easier path of having those played by the computer. I'm not sure yet the direction I'll take. For now I have my scratch track, and am curious to see the direction the vocals take the song in! For background on this series of posts, check out Blueprint for recording a song - introduction. The Line6 POD is my sound card, electric guitar amplifier and effects. It's an amazing piece of hardware. 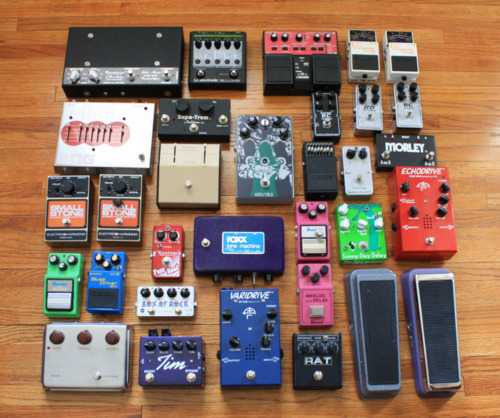 If I didn't have it, I would need: guitar amplifier, effects pedals, microphones, and some kind of audio recording interface that would capture the sound being sent to the microphones and send it to my laptop. But I have a POD, and it's magical. The setup is basic. My laptop is running recording software called Reaper. My guitar is plugged into the POD, and the POD is plugged via USB into my laptop. I prefer to record with headphones and the Sony's are by far my favorite (sound quality on them is phenomenal). This setup allows me to record high-quality WAV files (24-bit 44.1 k). It's really as simple as turning on my laptop, turning on the POD, plugging in the guitar, and hitting the record button in Reaper. The working title for the song is "All I Tried To Do". I currently have chord progressions figured out for 3 parts: Verse, Pre-chorus, and Chorus. I did a simple recording of each part earlier today. Think of these recordings as notebook sketches. Notice the guitar tone is clean without any effects. My goal was to quickly record each section in it's rawest form so I don't forget the chords and feel. With these parts I have enough to start figuring out the outline of my song. My next steps are going to be figuring out how to connect these sections together, figuring out the click track (aka the BPM, beats per minute of the song), and then recording a full (guitar only) take of the entire song. Here's to starting something new!